An exciting replay of the American hockey team’s defeat of the Soviets at the 1980 Olympics from Daily News sportswriter Coffey, who provides generous background on both teams. The sensational American victory became iconic for a country still mired in post-Vietnam malaise, infuriated by the Iranian hostage crisis, and depressed by a faltering economy. But this come-from-behind fairy tale is not what occupies Coffey. Enough of the jingoism and folderol, he writes: Who were these guys? What were they holding in their hands? Coffey proceeds to describe the mechanics of the game, with the US eschewing its usual dump-and-chase tactics to play with more finesse. “A well-conditioned teams wins in the first 10 minutes, maybe less,” the Soviets’ famed coach Anatoly Tarasov had once said. The US coach, Herb Brooks, knew that his team couldn’t wait too long to take charge; from the beginning, they needed to have the “speed of hand, speed of foot, speed of mind” for which the Tarasov-trained Soviets were famed. To achieve this, Brooks would have to overcome the bitter regionalism of the players and mold them into a symphony on ice. Along with the game’s play-by-play, Coffey braids into the story the backgrounds of the US players and as much of the Soviet players’ as he can. He shows the Americans adapting to a hard, aloof Brooks, happy to have a measure of luck (as well as poor Soviet tactics) on their side. Then come the years thereafter: the alcoholism and the vehicular homicide balanced against the pro careers and the successful restaurant business. 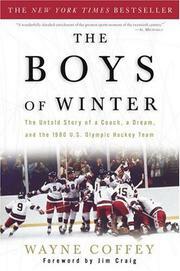 Coffey’s tale reminds us of a more innocent Olympics era, when doping and judging scandals were not common currency, when there were no millionaire professionals at play in an overhyped “dream team.” The 1980 hockey players were, contrarily, a bunch of amateurs and dreamers.